Over the years, West Orange has weathered many storms, and each time, I continue to be amazed and very grateful for the support and unity shown by our residents and employees. Our city is blessed with so many caring individuals who do not hesitate to set aside their own burdens in order to assist others. It will not happen overnight, but we will rebuild…the mounds of debris will go away…we will come back stronger and more determined than ever. Thank you all for your perseverance, your hard work, your patience and most of all your faith…your faith in God, in yourselves, in those around you and in our town. During its January 14, 2019 meeting the West Orange City Council passed Ordinance No. 443, calling the 2019 General Election. Durante su reunión del 14 de enero de 2019, el Ayuntamiento de West Orange aprobó Ordenanza núm. 443, convocando a la Elección General de 2019. A SAMPLE BALLOT is available for your review here. Una muestra de votación está disponible para su revisión aquí. You may view the notice of the testing of the AutoMark voting machine here. Puede ver el aviso de las pruebas de la máquina de votación AutoMark aquí. In accordance with Art. 105.012, et seq., of the Texas Local Government Code, the City of West Orange Texas is now accepting sealed proposals for depository services of City funds. Proposals will be accepted from any bank, credit union or savings association that may desire to be selected as a depository for the City until 10:00 A.M. Wednesday, May 15, 2019. Information may be obtained from Theresa Van Meter, City Secretary or Ramona Block, Deputy City Secretary, at 409-883-3468 or rblock@cityofwestorange.com. Proposals shall be delivered to Theresa Van Meter, City Secretary at 2700 Western Avenue, West Orange, Texas. 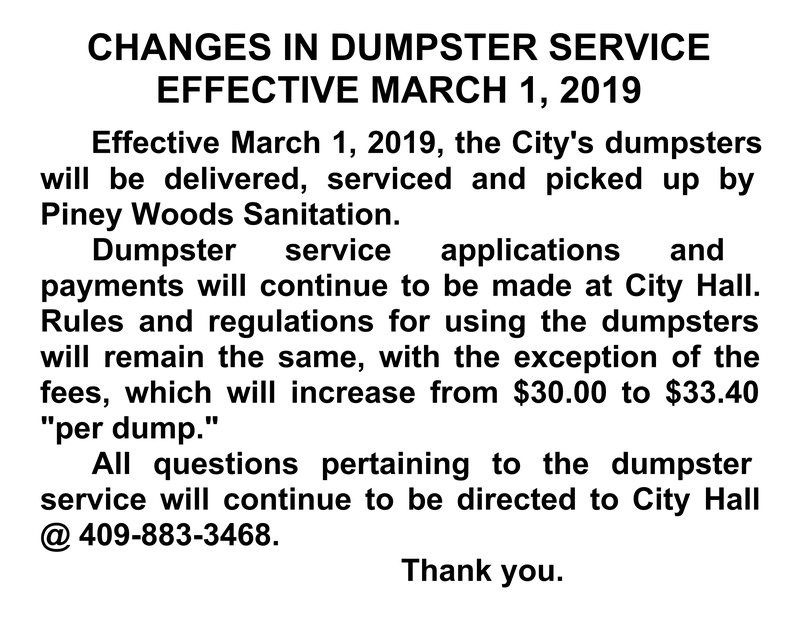 This contract is to be awarded by City Council at its June 10, 2019 meeting. The City reserves the right to accept or reject any and all such applications for City Depository. 27 MEMORIAL DAY – All non-emergency departments of the City will be closed. value for tax year 2018. You may now pay your garbage bill and apply and pay for building permits on-line. Click on the “ON-LINE PAYMENTS” tab on the top of the home page and follow the instructions from there. The City’s Ordinance which regulates garbage disposal was amended at it’s September 10, 2018 meeting. To see the newly-revised ORDINANCE, click here. For a copy of the APPLICATION FOR SOLID WASTE PICKUP SERVICES, click here. At its Monday, April 13, 2015 meeting, the West Orange City Council adopted an ordinance that establishes requirements for residential rental property to be registered and inspected annually. For a copy of the RENTAL REGISTRATION/INSPECTION APPLICATION, click here. NOTICE OF APPOINTMENT On July 25, 2011 at a legally held, open session, regular council meeting, the City of West Orange City Council appointed the following members to the “Fair Housing Activity Statement – Texas” (FHAST) Work Group: Group One members include (2): Council Member Shirley Bonnin Director of Public Works Michael Stelly. Group Two members include (3): Protected class member Billie Trahan, Affordable Housing provider Don Kreymer, School District Member Ruth Hancock.